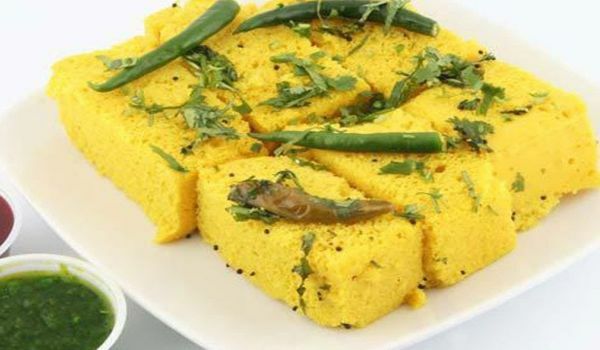 Moong Dhokla is a very popular recipe. Learn how to make/prepare Moong Dhokla by following this easy recipe. First soak the moong dal and rice together in water for 3 hours. Grind the soaked moong dal and rice with ginger, yoghurt, green chilies. Add water to the grind little by little till it comes to good idly dough. Take a tin and add 2 teaspoons of oil and salt to the dough. Steam the things in a kadai/ round pan for about 15 minutes. Cover the kadai/ round pan with a plat or lid till it cooks, then removes and cool it. Cut the moong dal cake into squares. Heat oil in a pan and add one teaspoon of mustard seeds. Wait till it crackles, when it crackles add remove and pour it on the dhoklas. Add Coriander Leaves and chilis to garnish.